Energy is the Most Important Commodity of the 21st Century. The Resulting Climate Change issues are causing a serious concern on the Energy Security of India which could lead to Energy being the most Expensive Traded Commodity as well as Utility in the Near Future. A distinctive feature of an energy inspection carried out by Russian Federation is its integrated nature. At the request of the customer the Company carries out a turn-key implementation of elaborated energy saving measures — from engineering and delivery to assembly and startup of equipment. Energy Performance Certificates (EPCs) grade your building, or part thereof, using a grade from A to G, with A being the most efficient and G the least efficient. EPCs are required for all buildings when they are constructed, sold or let. 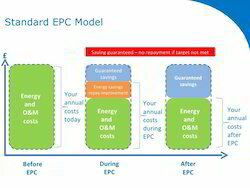 Energy performance contracting is a smart, affordable and inno¬vative method for saving energy and money. The concept behind performance contracting is the leverage money saved on energy and operating costs to pay for energy system’s improvements.